After 3 years of chaos the Pisa Mover shuttle is now operating between Pisa Airport and Pisa Centrale station with a journey time of only 5 minutes. This will make train connections from the airport to Barga more efficient. Atlanta, NEW YORK (JFK), Bournemouth, Belfast, Bristol, Coventry , Doncaster, Edinburgh, Edinburgh , Frankfurt , Gatwick , Glasgow , Leeds/Bradford , Liverpool , Manchester , Newcastle , Paris , Prestwick , Stansted . By Air to Pisa (Gallileo) airport, 59km from Barga. There are a number of car hire offices at the airport, and there are train and bus services to Pisa (Centrale) and to Lucca. We can arrange a taxi pick up for approx €110 for 2 (€120 for up to 4 people) from the airport direct to Casa Fontana. There is now a direct bus service by CTT Nord (You may need Adobe Acrobat to view timetable) from the airport to Lucca (Piazza Verdi) and another by CTT Nord from there to Barga (Click on the names for timetables) From Pisa there are rail connections to Barga-Gallicano (5km from Casa-Fontana). There are also regular scheduled flights to Bologna (150km). Car Hire: Cars can be hired from Pisa Airport (Note: We DO NOT recommend GOLDCAR who have a bad reputation for insurance scams!) 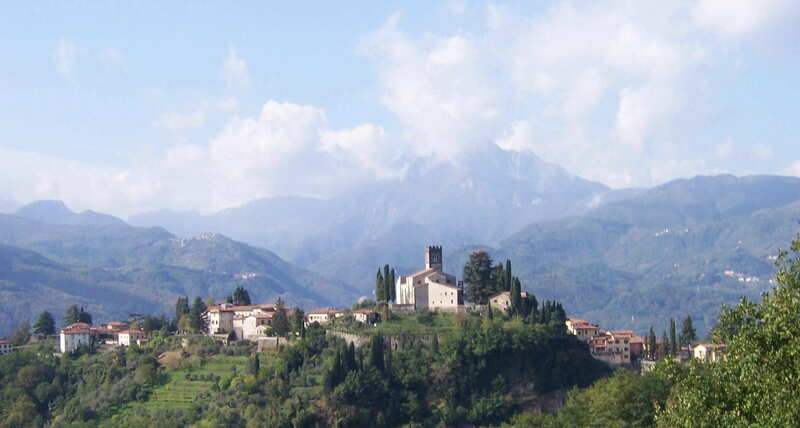 and it is worth booking online to get best value but you do not need a car in Barga. By Car: The main Autostrada from France and Switzerland passes along the Riviera coast. Leaving it at junction Via Reggio-Camaiore, head for Lucca on the SS12. From Pisa airport turn right out of the airport onto the Fi-Pi-Li (signposted Firenze). About 4km from the airport turn right onto the SS12 which skirts to the north of Pisa, to Lucca, then northwards, following signs to the Garfagnana, to Barga. It is easy to get to Barga from Lucca following the SS12 northwards to just beyond Ponte a Moriano, where you take the road to the right (SR2) signposted to Castelnuovo di Garfagnana. When you reach the brown "Welcome to Gallicano" sign, turn right, across the river (signposted to Barga and Fornaci di Barga). Cross the river, up the steep rise to a T junction where you turn Left. Pass through Coreglia and Ponte al Ania and into Fornaci di Barga. As you enter Fornaci from the south, Barga is signposted on the right. That road winds up past the church at Loppia then winds on for another couple of km till you will see the Duomo of Barga on the hill to the right. You will then arrive at the main car park (Fosso) and gate (Porta Reale). Don't park here, but continue past that car park down via G. Marconi, cross the bridge and turn right at the next main road. (As you turn right, there should be a hotel (the Alpino) on the left and a big pine tree in the middle of the road). Up the hill and take the third road on the right (after the sign for "la Fenice") via dell'acquedotto and park in the public car park, to your right, in front of the red brick office, or if that is full there is another one opposite, in front of the high school. Do NOT drive further down the via dell'acquedotto as it becomes progressively narrower! Leave your bags in the car and walk down via dell'acquedotto, under the acqueduct and up the hill, turning right into the city gate (Porta Macchiaia). Continue on that road another 30 metres or so and you will see Casa Fontana in front of you at no. 77 Via di Mezzo. By Train: The train service from Barga-Gallicano station (NOTE it is about 5km from Barga) gives easy access to Lucca, Pisa, Florence and Siena, making day visits to these historic cities possible. Online train timetables and booking are available from TrenItalia on http://www.trenitalia.it/. (for Barga enter: Barga-Gal) If you intend coming to Barga by train, it is advisable to pre-book a taxi as there is not a taxi rank at the station!